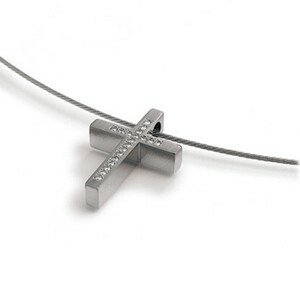 This titanium cross has 19 genuine diamonds equaling a total weight of .10ct. Titanium is a durable, lightweight metal that is very friendly to the skin. If you have ever had an allergic reaction to the nickel found in many metals - try Titanium! Pendant is shown with a steel cable that is not included in the price. Steel cable wires can be purchased here.